This semester I joined the green roof project on top of the Langford Architecture Building. The first time I was up there It looked pretty dim. There were three giant, largely dead walls, and two scraggly squares of roof garden.Despite the situation the other people seemed to have even bigger plans for the project. Now months later lots has changed, and the bigger plans are being achieved. There is another strip of roof garden, filled with vegetables. The scraggly square gardens are both looking much more green, and the walls have been all cleaned off. I have been impressed by how much was accomplished by the small team of people for a couple of hours each week. 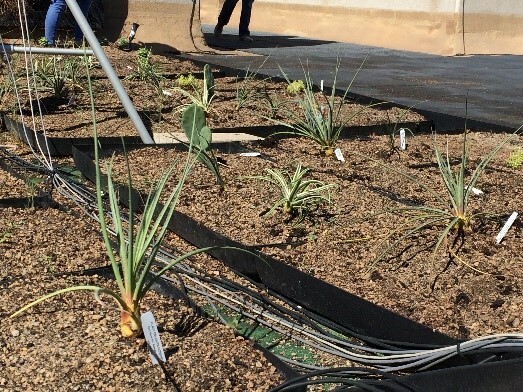 As a group, the class has tackled challenges of building and programming an irrigation system, and continually having to cope with their many failures. While the project rolls with these punches I have been able to see that succeeding is not contingent on executing plan A, but instead on learning to work with the problems. Being responsible for something that is actually happening is the most rewarding aspect of this experience for me. In my other classes or labs, all of the things I did were unimportant, and had no consequence other than my own level of enrichment. Here on the roof I finally have experienced the cliche learning by doing. I have been responsible for planting, counting, building, cutting, programming, and brainstorming things that we need to work in order to accomplish real goals. There are real results and consequences to everything that happens, unlike many of the models or examples I have done in other classes. The way that the group overcomes challenges in order create a successful green roof forces me to stretch myself and learn about a wide variety of things, that all get directly applied to a project. Since the class is really attempting to create something, and not operating in a designed curriculum, I have learned how to deal with the way that the real world affects the project. Sometimes this manifests itself by in the form of unforeseen lessons, such as the time I learned how to use the hand tool to cut PVC pipe. In this project I have experienced more from formulating and working towards our goal, than I did operating in a classroom module. 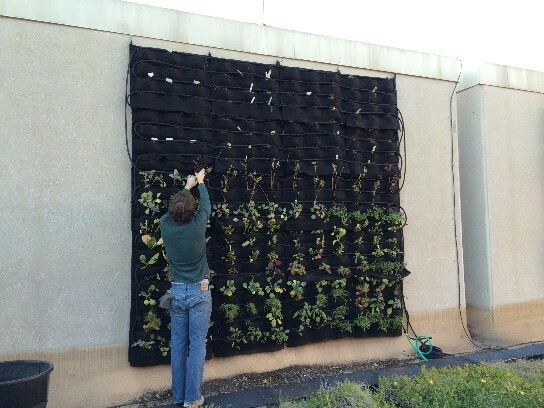 Last week we moved on from the roof garden and its challenges, and began to prepare one of the living walls. We are attempting to bring to life the more unorthodox pocket-based green wall. The wall is made of two giant plastic poster boards, on to which 50 felt pockets each area attached by staples. Right now, there is nothing but dirt wrapped in cloth in the pockets, but in a few month hopefully all the pockets will be filled with green plants wrapped up in their clothes. To help improve this new seasons survival, we are reworking the irrigation system. 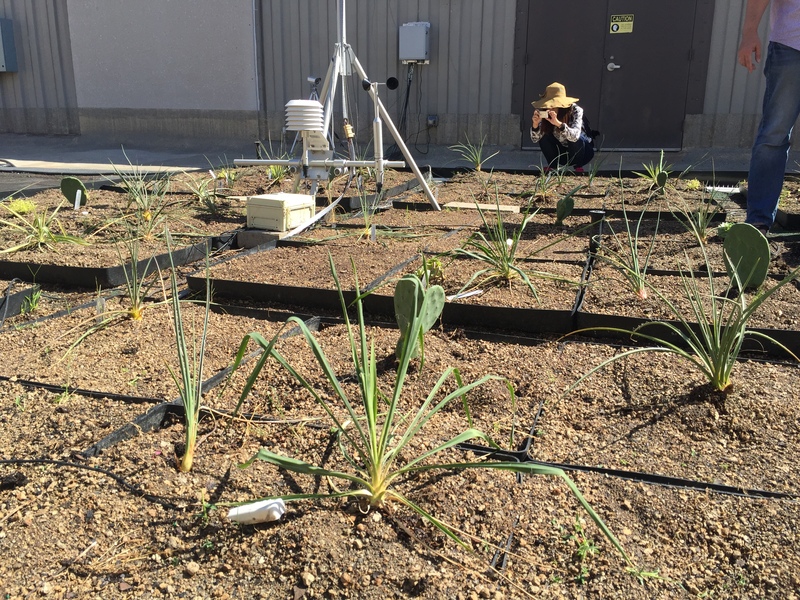 The previous system was flawed in that it only distributed water directly to 25% of the plants. 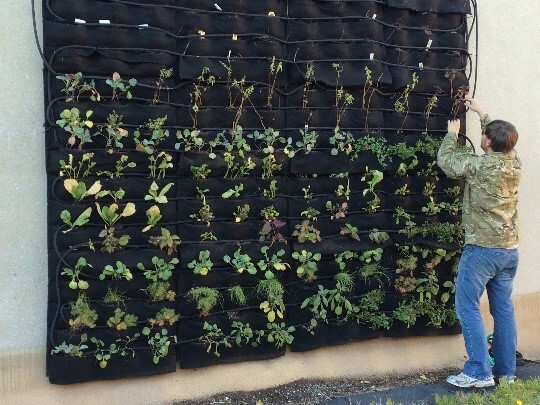 Usually this would be a great number of plants to directly water, but the unique situation of being a pocket-based green wall create conditions that allow for almost no indirect access to water. Being so, every single pocket on this green wall needed direct access to water being emitted from a hose, but how can we accomplish that? I thought that by weaving a series of soaker hoses through the wall so that every row was watered by alternating hoses would allow each pocket the maximum amount of water. Not a week after brainstorming the idea, we have nearly installed the entire new system. I am looking forward to next weed when we can finally plant the wall. 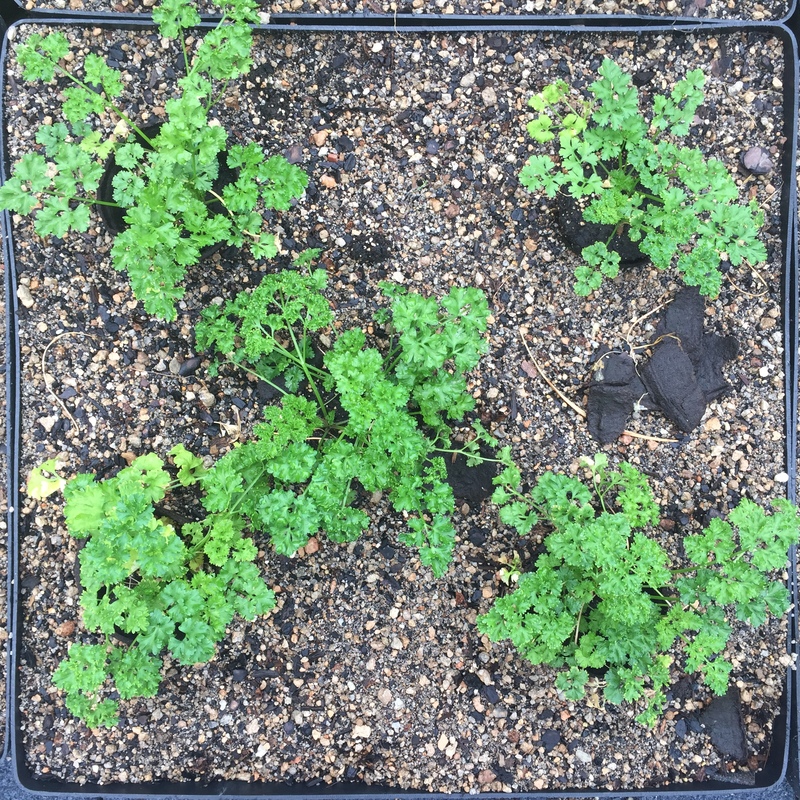 I do wish that we had radishes, because I think that each individual pocket would be well suited to grow individual radishes. I think sometime we ought to try planting some radishes on this wall, because they would be much easier to harvest growing above ground level. 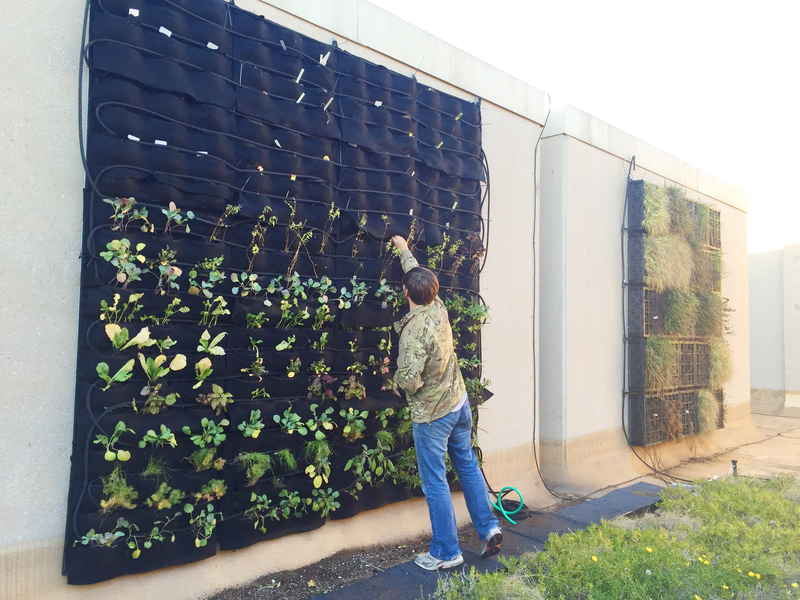 transforming the grey squares on the roof into green patches of life, and It was great turning the dry wall into a vibrant garden. 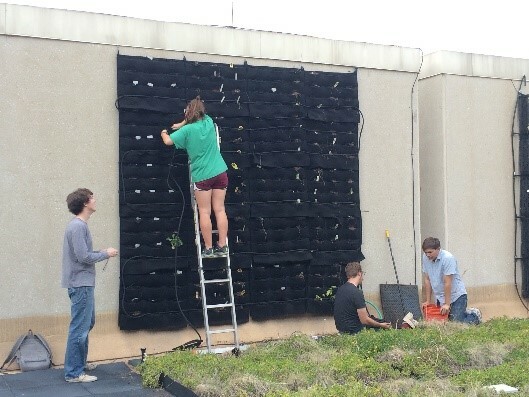 The last process for the green roof work is to grow plants on the wall. Before doing the planting work, our team had a discussion about plants selection. We selected different types of vegetation. Next step is to layout the irrigation pipe. Each row on the wall needs to have its own irrigation pipe, then the plants on each row can get enough water. After layout all the pipes on the wall, it is time to grow plants. We planned to grow taller vegetation on the high area of the wall, and grow lower vegetation on the bottom part of the wall. Doing the planting process, we need to clean the dead plants from the planting bed and re-wrapped the new plants, then put the new one on the wall and ensure each plants could get enough water under the irrigation pipe. After finishing all the above steps, the walls planting work is done. 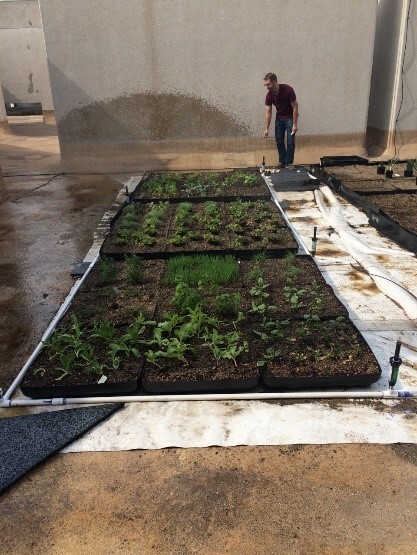 Doing this semester’s green roof learning experience, I really learned a lot of practical knowledge, for example, I learned how to layout the irrigation pipe on the wall and on the ground; I learned how to select suitable plants for the green roof; I learned how to grow plants on the roof and so on. It will be a valuable experience for my future development as well. After we finish the weeding and plant selection process, it is time to plant and layout irrigation pipe. Irrigation is very important for the plants grow healthily on the green roof, because the roof environment is much harsh with less rain. We planted the vegetables in the 9 blocks, each vegetables grow in one block, which is regular and easy to maintain, we also layout the irrigation pipe. Now, they grow well during one week, following are the images show us the condition of irrigation pipe and vegetables. 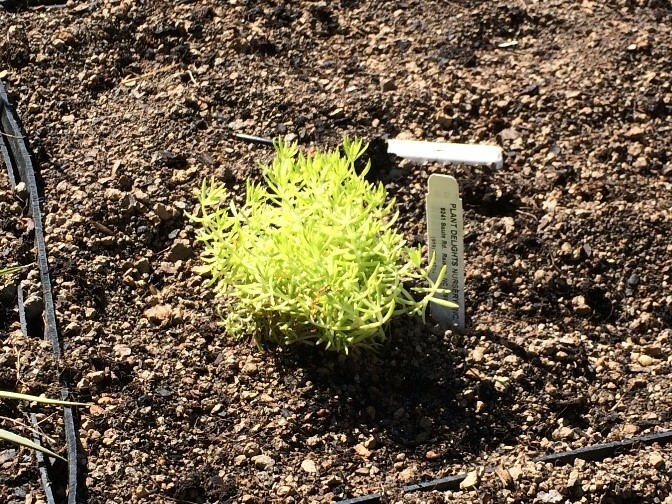 We also planted succulent plant. First we need to think about it, because different plants have different shapes and habitats, it will be a mess if we plant them optionally. We have to think about how to layout them in a good sight and what is the easiest way to maintain them. 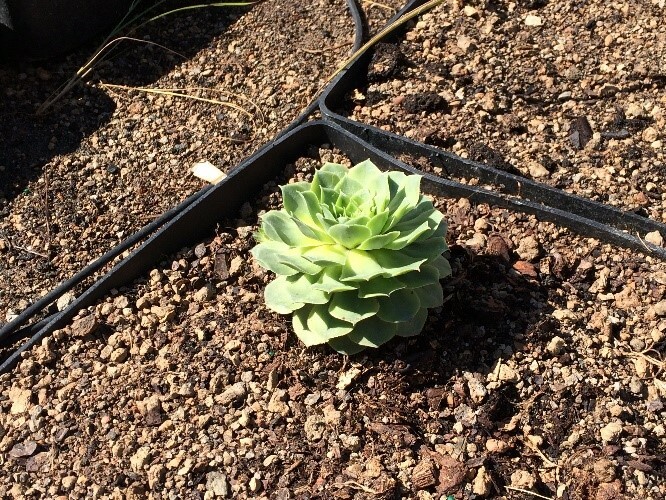 So we decide to plant the taller ones in the middle of each block, surrounded by some smaller succulent plant, like Mexican Sedum, Ghost Plant and so on. Also we need to plant one species closely instead of planting them disordered, it will make the whole block looks neatly and lively. Every Friday when we go to the green roof, we can see the difference about these plants, I feel very happy to have this opportunity growing green plants by myself, it is a good experience to use what we learned from the class into the real situation. Since it is not the first time for me to work on the green roof, I am more familiar with the working experience. 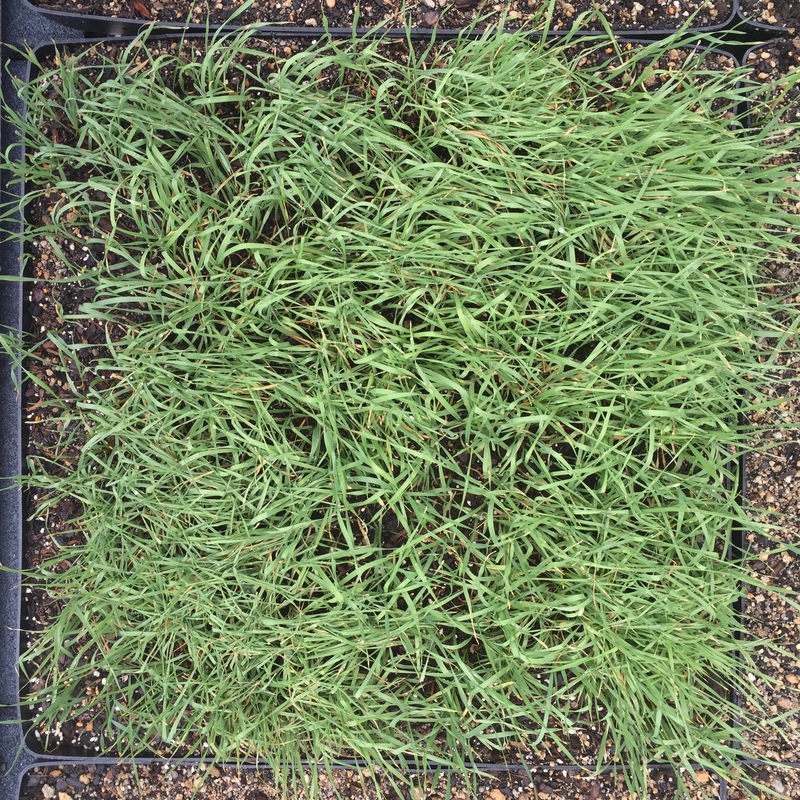 In the summer 2015, I am lucky to have an opportunity to work on the green roof with Dr.Dvorak, which is the first time that I really understand what green roof really looks like. 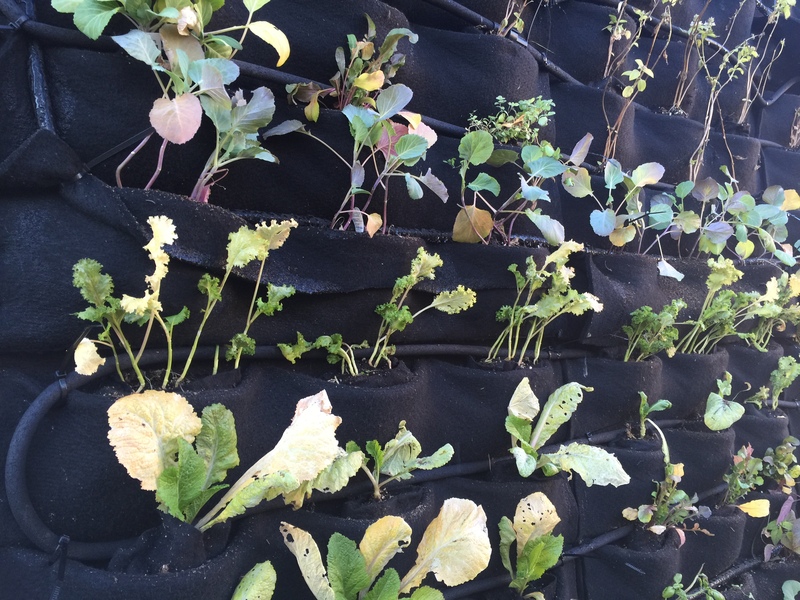 In the summer time, our major work is to design and layout the plants for living wall, which attracts me a lot and I really learned a lot from that experience. In the fall, the work is a little bit different. A good growing environment is very important for the plants, the roof is overgrown with the weeds, so we need to do some weeding work first. It is hard to remove all the weeds, especially the smaller ones. After a rainy week, the weeds would grow again if we do not finish this step seriously. 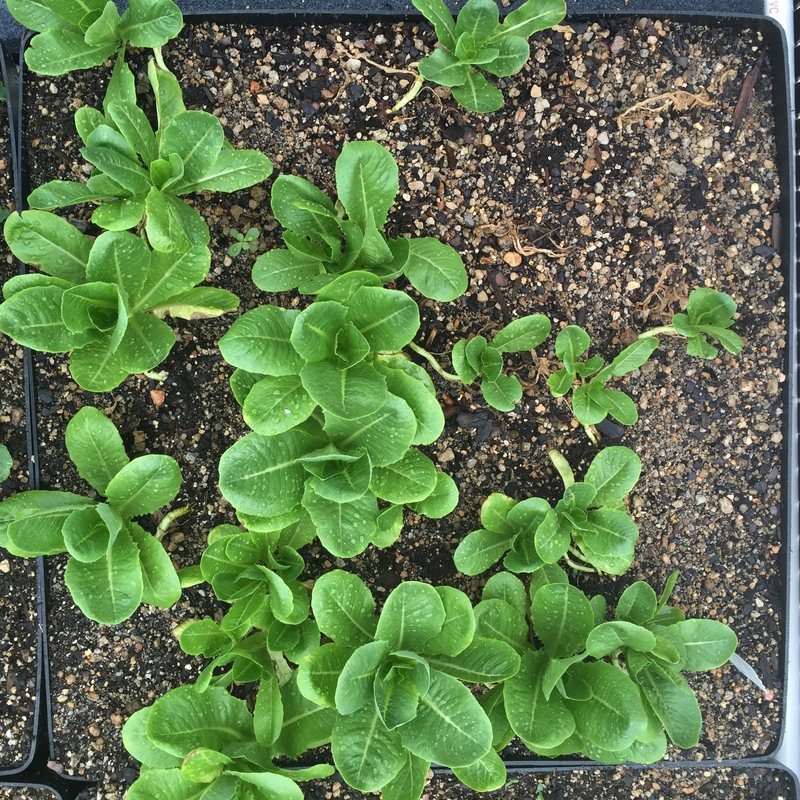 We need to know that every step is important for the plants. 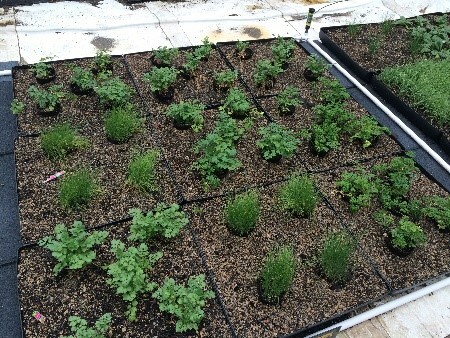 After finish the weeding work, we need to select plants for the green roof. 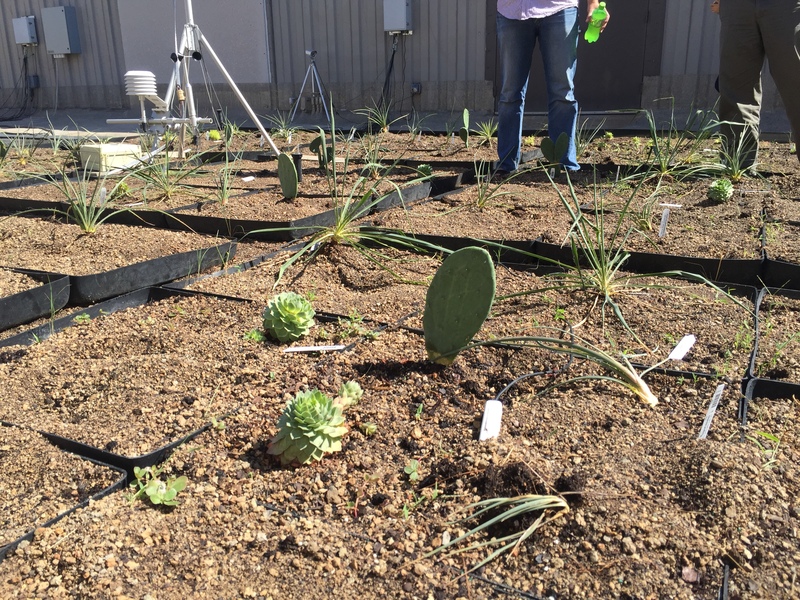 The following plants will be planted on the roof: Beargrass(25), Red Yucca(16), Mexican Sedum(13), Brakelights Red Yucca(12), Houseleek(12), Resin Spurge(8), Spineless Prickly Pear(8), Candelilla(8), Louisiana Yucca(8), Color Guard(4), Ghost Plant(4), Palmer’s Sedum(4), Mescal Ceniza Agave(4), Spider Agave(4). The reason why we choose these plants is that they can survive in the tough environment with more sunshine and less water. We also add 9 small blocks for the vegetable grow on the roof, for example, green onion, vanilla and so on. 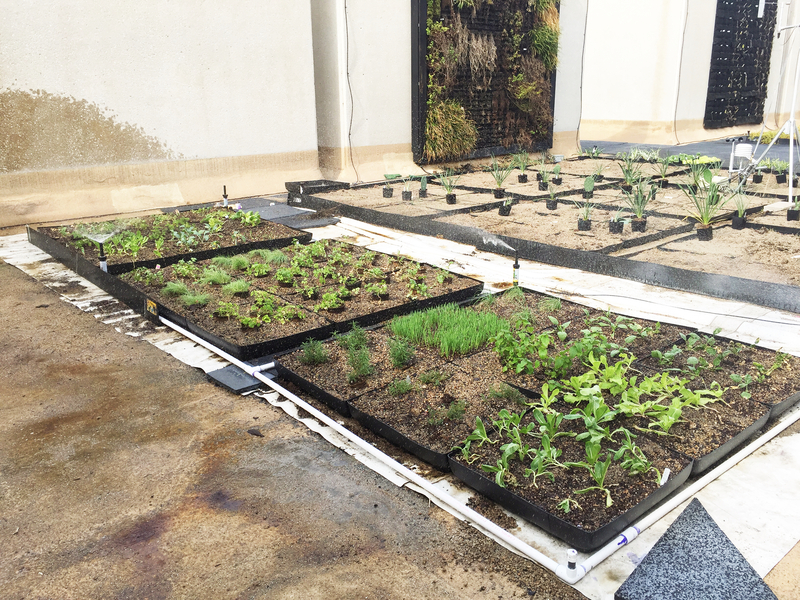 It is the first time for me grow vegetable in the green roof. In China, people always grow vegetables in the greenhouse, which could always provide constant temperature for vegetables and fruits. 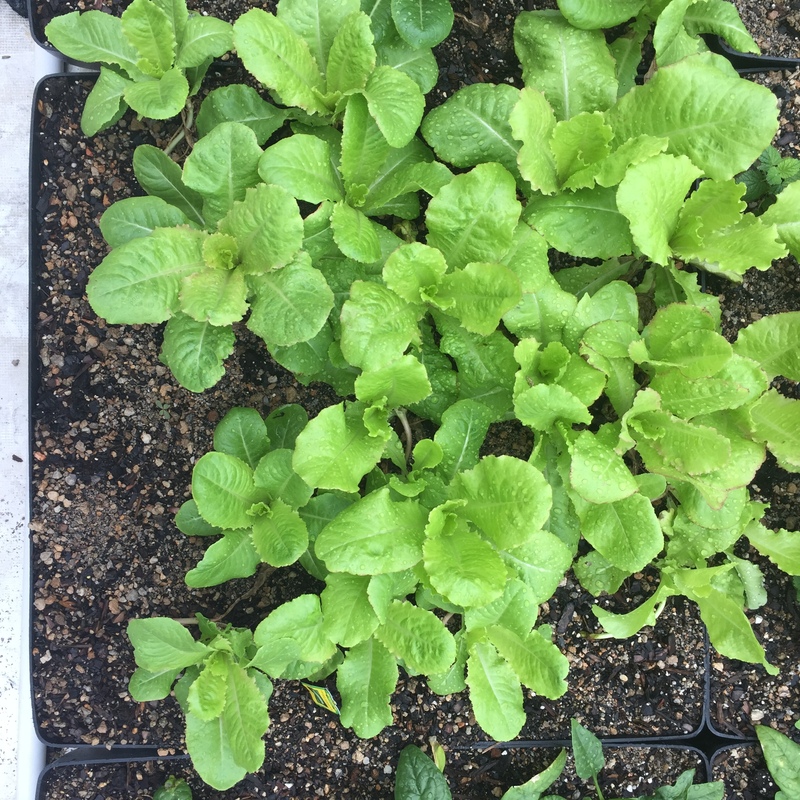 These vegetables we selected can also survive and grow well in the tough environment. 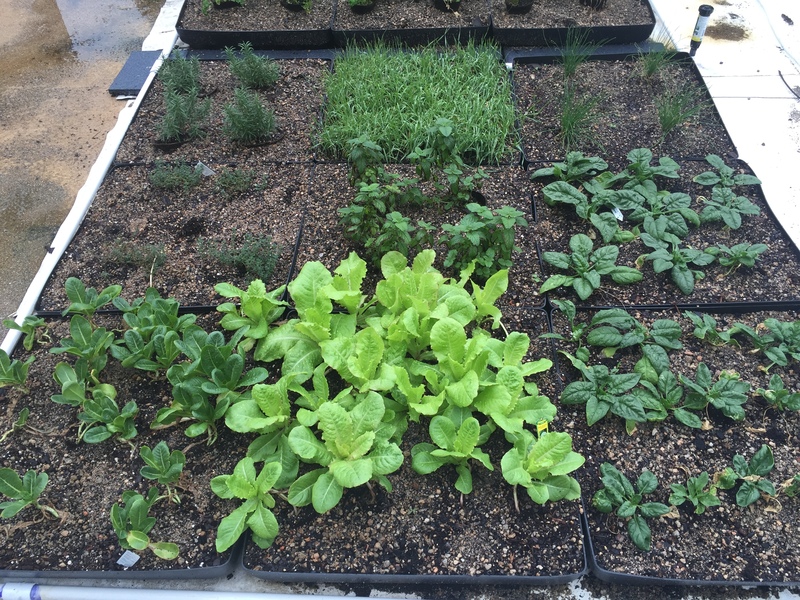 With all these vegetables and plants, the green roof would be more colorful and alive.